This week, in a departure from the norm, we're not serving any saucy nuggets. Instead, welcome to our brand new and original, possibly never-to-be-repeated feature: Bumper Old School Analysis. Could this serve as a break-out game for Jets' rookie Sam Darnold? While he posted unspectacular numbers, Darnold produced the first late-game heroics of his pro career and reminded Jets fans that he hopefully has a very bright future as an NFL starter. After a slow start, which was interrupted by an excessively conservative gameplan and a trip to the locker room after tweaking his foot, Darnold was pretty dialed-in after half time. Despite having one pass batted down, one dropped and at least one that he deliberately threw away, Darnold still completed 67 percent of his passes in one of his most accurate games of the year. After a momentary setback with a third quarter interception on one of the most ill-advised passes he's thrown all season, Darnold capped off an 85-yard drive with a spectacular seven-yard touchdown pass to Robby Anderson. Darnold ran all the way back to almost the 30-yard line as he rolled away from the rush and then connected with Anderson on a pinpoint pass in the end zone. 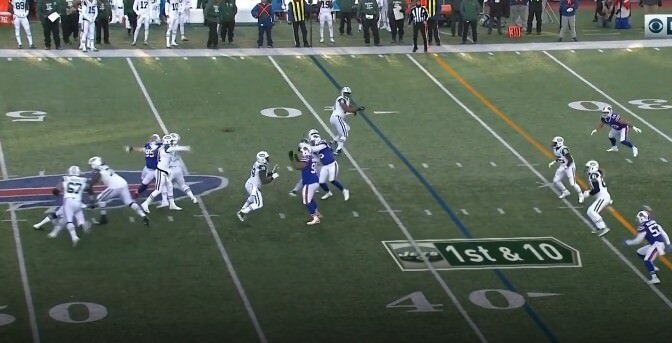 Darnold also impressed on a long out to Anderson earlier in the game and a similar throw to Chris Herndon where his ball placement was in a ideal spot where only Herndon had a chance to go up and get it. However, his coup-de-grâce was a deep ball to Anderson that set up the game-winning touchdown. The usual deep dive with more in-depth coverage of Darnold's performance will follow later today. As for Josh McCown, who entered the game briefly while Darnold was in the locker room, he "led" a "scoring drive" on his only possession. (Actually, the Jets went just three yards in three plays before settling for a field goal as they ran twice and McCown's only pass was batted down at the line). After having had a rough year, the Jets offensive line deserves some credit for this performance, which saw the Bills failing to register a single quarterback hit or sack. They did create pressure on a number of occasions though, including on the plays where Darnold threw his interception and touchdown pass. In terms of the running game, you can credit the Jets for not abandoning the run even though they didn't have a great deal of sustained success. They averaged just 2.8 yards per carry, but 34 of those yards came on one play without which they would have averaged just 1.6 yards per carry. Nevertheless, they blocked well enough for the Jets to get into the end zone on two short yardage runs and also to convert a 3rd-and-1 run earlier on the game-winning drive. Other than a Darnold scramble, the 34-yard play was the only rush of more than six yards on the day and it relied upon a combo block on the right side of the line with Brandon Shell driving his man to the inside. Shell otherwise had a solid performance, although he allowed his man to get into the backfield on the play where Darnold was flushed out and threw an interception. He also had at least one play in the running game where his man got off his block to stuff a run. Left guard Spencer Long also had a pretty solid game, working well with center Jonotthan Harrison on some combo blocks in the running game. He did well in pass protection, although Kyle Williams got around him on a stunt to pressure Darnold on the play where he ended up throwing his touchdown pass. Harrison didn't fare quite as well as he allowed some penetration and had a couple of bad snaps. On the crucial 3rd-and-short conversion near midfield on the winning drive, Harrison's man shed his block and nearly blew the play up, although the rest of the offensive line was able to drive the pile past the marker. Harrison also dragged the runner past the marker on that play, which strictly speaking is illegal and could have been flagged to negate the run. The other starter, right tackle Kelvin Beachum, had the key block on the Jets' other rushing touchdown. However, he allowed his man to penetrate and shed his block to stuff another run. In pass protection, Beachum got beaten a few times around the edge, with Jerry Hughes getting around his block with a good pass rush move on the play that led to Darnold's interception. He was also bull rushed into the backfield to collapse the pocket on the play where Darnold threw his touchdown pass, although he atoned for that by lighting up Williams on the back end. Finally, reserve Brent Qvale got some extra work as a jumbo package tight end and was on the field for the game winning touchdown, although he allowed his man to get off his block to stuff an earlier run. With Isaiah Crowell going down early with a foot injury, Elijah McGuire got a bigger workload than ever before and responded with a nice game. McGuire ended up with 83 yards from scrimmage and the game-winning touchdown on 20 touches. This included the aforementioned 34-yard run. On the play, McGuire made a quick cut and made himself skinny to get through the hole then burst into the open field and picked up additional yardage down the field with a nasty stiff-arm. He also had a nice first down catch where he broke a tackle in the flat and finished the run strong to get to the marker. McGuire also played a big part in the winning drive, with a short yardage conversion on third down and the game-winner from the goal line on fourth down. However, he had a rare lapse in pass protection that led to a pressure. Prior to his exit, Crowell didn't have much success with just seven yards on three touches, but Cannon had even less success with just seven yards on seven touches. However, Cannon did score his first NFL touchdown, plowing in up the middle from the four-yard line. Anderson came up with a big game again this week, leading the Jets for the second week in a row as he ended up with 76 yards and a touchdown on four catches. He almost had a second touchdown in the closing stages but was just out of bounds as he came down with the ball on Darnold's fade route. Other than his touchdown catch and the deep ball that set up the game winning touchdown, Anderson was also the recipient of another of Darnold's best throws on a long out for 25 yards that came on 3rd-and-long. His other catch was a valuable one as well, as a quick slant converted on 3rd-and-2 to set up a field goal. However, he missed one block in the running game. Aside from Anderson, the Jets wide receivers weren't very productive. Quincy Enunwa caught three passes, two underneath for short gains and the other for 11 on the outside as Darnold made an accurate throw on the move. Jermaine Kearse and Rishard Matthews caught one pass each. For Matthews, his six-yard catch was his first as a Jet as he barely played. Kearse caught a 10-yard pass underneath as he was just able to get to the marker. Charone Peake played just one snap. Tight ends Chris Herndon and Jordan Leggett each had a nice first down catch with Herndon going up to get it on a long out and Leggett open down the seam. However, Leggett also juggled and dropped a low pass right before Darnold's interception. Herndon had a solid block on Cannon's touchdown run and one other short catch negated by a penalty. That play is a good one to illustrate the difference between Tomlinson and Herndon's blocking abilities. You'll note that Tomlinson sustains his block at the point of attack against a defensive end, while Herndon (whose blocking is actually really improving over the past few games) gets driven off his spot by a safety which nearly blows up the entire play. Reverse their roles here and this play wouldn't stand a chance. If you've ever wondered why Tomlinson's blocking ability adds value even though he might not always grade out any better than the other tight ends, it's because he can handle the tougher assignments such as this and tends to get a much more difficult workload as a result. On defense, the Jets surrendered 176 yards on the ground, although 101 of those came from Josh Allen and they also gave up some significant yardage on end around type plays, including a 15-yard touchdown run. In the conventional running game, the defensive line held up well and even dominated the point of attack at times. Once again, Leonard Williams might draw criticism for his statistical output (three tackles, two quarterback hits) but he was easily the Jets' most disruptive lineman. Unfortunately, a roughing the passer penalty and a couple of missed opportunities to make plays in the backfield ate into his overall impact. All three of Williams' tackles came close to the line of scrimmage including one where he stayed at home on a cutback run to make a run stuff in the red zone. He also held up well at the point of attack this week, blowing up one other run with penetration. Williams also generated pressure several times, although two of those plays were negated by penalties. At nose tackle, both Mike Pennel and Steve McLendon made good contributions this week as they had six tackles between them, all on runs of four yards or less. Each also had one quarterback pressure. Pennel saw the most reps as the Jets are perhaps transitioning to him becoming the starter next year. After only playing 12 snaps last week - a season low - rookie Nathan Shepherd saw his workload increased back up to 19 snaps this week but he didn't make much of an impact as he was controlled at the point of attack on a couple of runs. He had just one tackle and chased Allen from the pocket once. With Darron Lee out this week, the Jets mostly used Neville Hewitt in his place. However, Kevin Pierre-Louis arguably made a bigger impact despite being limited to situational work. Hewitt still made some positive contributions as he ended up with seven tackles, including two run stuffs and half a sack. However, he was fooled by misdirection a few times, missed a tackle and gave up three first downs in coverage. Pierre-Louis only played 13 snaps but had three tackles, a strip-sack and a big hit on Allen that forced him to miss a throw to the endzone. He also recovered well to disrupt the pass to Allen on the "Billy Special". However, he also gave up a first down in coverage and missed a tackle on an Allen first down scramble. Avery Williamson had a quiet game with just five tackles, only one of which was close to the line of scrimmage, although another run stop was negated by a penalty. Williamson generated pressure on a couple of blitzes and also blew up the full back Bart Scott-style on a run blitz. However, he had a bad blown coverage as he was fortunate that a receiver he had left wide open dropped the pass and was also called for illegal contact once. There was one key contribution in coverage though, as he sniffed out a swing pass to the flat and avoided a block to get out there quickly. That forced Allen to eat the ball for a sack. Off the edge, Brandon Copeland had easily his most productive game of the year as a pass rusher as he pressured Allen several times, although most of these came as he was unblocked. He recorded a sack on a nice inside move and was in on one other tackle. Perhaps his biggest contribution was chasing Allen out to the sideline leading to him forcing a throw for his first interception. There were also some negatives for Copeland, who was completely fooled on the end around play where Buffalo scored their second touchdown. Jordan Jenkins and Frankie Luvu got plenty of time too, but their impact wasn't as significant. Jenkins had two tackles, including a tackle for loss, and a couple of pressures, but also had an unnecessary roughness penalty. Luvu also had a couple of pressures but missed a chance to complete a sack in the backfield. He made two tackles, one on a play in the flat and another on a run stuff. Reserves Tarell Basham and Jeremiah Attaochu were active but Basham didn't play and Attaochu ended up playing just three snaps, including one where he jumped offside on 3rd-and-4. Having come in for some criticism earlier in the year, Trumaine Johnson had another big game and is perhaps starting to show what the Jets saw in him when they gave him a big money deal in the offseason. Johnson's two interceptions on errant passes by Allen helped clinch the win but it was his overall consistency that stood out. The only catch Johnson gave up in man coverage was a 12-yard pass on 3rd-and-20 on which he was playing off and made the tackle immediately to force the Bills to attempt a long field goal (which was missed). One other target was dropped and a short completion on the first play of the game was negated by a penalty. Johnson was also in on one run stop near the line. On the other side, Morris Claiborne wasn't quite as successful, although he did lead the team with eight tackles. Claiborne gave up five catches on six targets, including a couple of first downs, and had a missed tackle. In the slot, Buster Skrine got beaten for a couple of first downs and had a couple of big penalties for roughing the passer and pass interference down the field. However, he made some positive contributions, including a tackle for loss on a running play and a couple of good plays in coverage. He also chased Allen down on a roll out and limited him to a short gain by forcing him out of bounds. Reserve Rashard Robinson was called into action when Claiborne was temporarily sidelined and the Bills immediately went after him for a 3rd-and-2 conversion on an out-breaking pattern and a 38-yard gain on a deep ball. Robinson looked out of his depth on those two plays, as if he wasn't prepared to be called into action. At safety, Jamal Adams had just one tackle - on a run stuff - but don't be fooled, because this was another great performance from Adams, who continues to play at an elite level. Adams also contributed two quarterback hits, a couple of other pressures and a fumble recovery and blew up a screen pass on a play where the Jets ultimately accepted a penalty so it didn't count. Perhaps his only negative was that he took a bad angle on the reverse for the Bills' second touchdown. Darryl Roberts once again played the deep safety role and did a solid job, although he dropped a potential interception down the field. He was in a good position on a third down pass in the red zone, forcing the Bills to settle for a field goal on their first possession of the second half. In a departure from the norm, there was only one touchback in the entire game, so the return and coverage units got more work than usual with the Jets once again benefiting from some impact plays. Andre Roberts had a monster day on kickoffs, as he boosted his numbers with returns of 51 and 86 yards. However, he also muffed and then fumbled away the opening kickoff of the second half. The Bills eventually resorted to squib kicking the ball to keep it away from him. Herndon fielded one and ran it back to the 35. Tomlinson had an early penalty while blocking on a return, but atoned for that with good blocks on each of Roberts' long returns. Herndon and Luvu also contributed good blocks. In coverage, Darryl Roberts was the only player credited with multiple special teams tackles, but Rontez Miles also made a nice play. Copeland also made a coverage tackle near the sideline but was lucky that he didn't get called for a late hit. Cannon and Basham each missed a tackle, but Cannon forced a fair catch by blowing past his man in punt coverage. Henry Anderson was also lucky not to be penalized for a cheap shot on the Bills kicker, although he may end up getting fined. That came after Anderson blocked a field goal as time expired in the first half. Miles tried to run it back, then fumbled it, so Terrence Brooks picked it up but the play was blown dead because he was not allowed to advance it within the two minute warning. Punter Lachlan Edwards had a light workload, punting just three times. He boomed one 56-yarder and put another inside the 10, but his last punt was poor as it was fair caught outside the 20 from near midfield. Kicker Jason Myers made all three of his extra points and first half field goals of 47 and 21 yards. His touchback percentage will have dropped in this game after he only managed one. Presumably the conditions played into that but the Bills didn't have much success in the return game so it worked out pretty well anyway. While some fans will be disappointed to have won another game with the allure of a high draft pick if they were to keep losing, those end-of-game reps for Darnold are the biggest thing to come out of this week's game. For Darnold to have a successful career, he's going to have to show he has that elusive "clutch gene" and this was his first real opportunity to display that. He's also developing some nice chemistry with Robby Anderson. Defensively, and on special teams, there were some really good signs from the Jets, especially in the trenches, and there were fewer coverage breakdowns than in recent weeks. However, they still have a few things to work on, including dealing with the threat of running quarterbacks and misdirection runs. Next week's game, which if you were not aware or needed reminding is on SATURDAY, pits the Jets against a Texans team that should provide another good test as the season winds down.